Ferry, bus and ferry: One option is to take a ferry from Koh Lanta’s Saladan Pier to Klong Jilard Pier near Krabi Town. 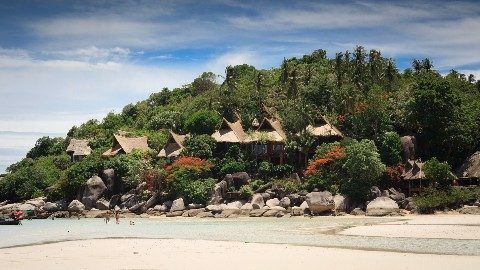 From Krabi Town you then take a bus or minivan to Donsak, which is a coastal area near to Surat Thani town, where a number of different ferry companies operate services to Koh Tao. Car ferry, minivan and ferry: Another option is take the short car ferry crossing from Koh Lanta’s other ferry pier, Klong Mak Pier, and then take a minivan to Krabi town. From Krabi town you then need to travel to one of the ferry piers in Donsak for the sea crossing to Koh Tao. Train from Trang and then a ferry from Chumphon: You can also take the car ferry and then a minivan to Trang. From Trang there are two trains a day to Chumphon. The quickest and cheapest ferry services to Koh Tao depart from ferry piers near to Chumphon town. If you choose this option bear in mind that you will need to spend one night in a hotel in Chumphon as both train services arrive in Chumphon late in the evening and you will need to wait until the following morning for a ferry to Koh Tao. The Seatran Discovery service departs from Saladan Pier. Passengers on the Jolly Travel service are picked up by minivan from their hotel or resort in Koh Lanta. Seatran Discovery: This service takes 10 hours 5o minutes to reach Koh Tao and will suit travellers who prefer to travel by ferry over travelling by road, as passengers spend a higher proportion of the journey on a ferry than they do on the Jolly Travel service. Jolly Travel: This service is the quicker of the two services completing the journey from Koh Lanta to Koh Tao in 10 hours or less depending on weather conditions. The Seatran Discovery and Jolly Travel services follow different routes and use different ferry services to transport passengers from Koh Lanta to Koh Tao. The journey with Jolly Travel starts with a hotel pick up by minivan taking passengers to Klong Mak Pier on Koh Lanta Yai for the short journey by car ferry to Hua Hin Pier on the mainland. From Hua Hin Pier passenger then get back on the minivan for a journey of approximately 1 hour to Krabi Town. In Krabi Town passengers transfer to another minivan for a journey of around 2 hours 30 minutes to Laem Thuat Pier in Donsak where passengers transfer to the 16.00 Lomprayah High Speed Ferry service to Koh Tao. The ferry takes 2 hours 45 minutes to reach Koh Tao. The first stage of the Seatran Discovery service from Koh Lanta to Koh Tao is a ferry journey from Saladan Pier to Klong Jilard Pier near Krabi town. From Klong Jilard Pier passengers are transported by minivan to the Seatran Discovery Office in Krabi town centre where they transfer to a bus for the journey to the Seatran Ferry Port which is in Donsak, Surat Thani province. At the ferry port passengers disembark from the bus and board the 14.30 departure on the Seatran Discovery Ferry for a 4 hour sea crossing to Koh Tao. Saladan Pier is the departure point for the Seatran Discovery Service to Koh Tao. Car ferry services depart from Koh Lanta’s Klong Mak Pier which is on Koh Lanta’s north island. Which ever way you travel from Koh Lanta to Koh Tao your point of arrival will be one of the ferry piers in Mae Haad. There are two trains a day from Trang, which is the nearest train station to Koh Lanta, to Chumphon, which is the closest train station to Koh Tao. Train #84 is the slightly faster train service, scheduled to complete the journey from Trang to Chumphon is 6 hours 25 minutes, compared to Train #168 which is scheduled to complete the journey in 6 hours 52 minutes. However, Train #168 is likely to be the better option for most travellers because of the earlier arrival time in Chumphon.